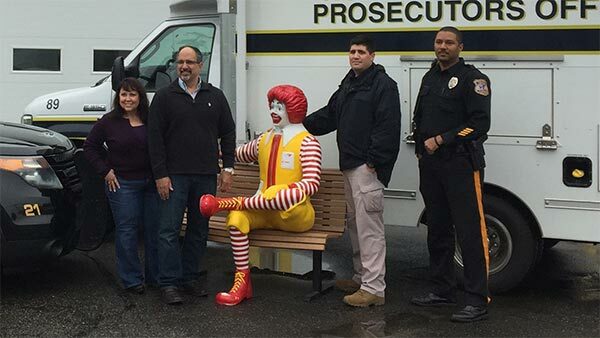 CLINTON, N.J. (WPVI) -- Authorities have made an arrest stemming from the theft of a life-size Ronald McDonald statue that was taken from a McDonald's in New Jersey last month. Hunterdon County prosecutors say 56-year-old Thomas Roman, of Point Pleasant, is charged with receiving stolen property. It wasn't known Saturday if he's retained an attorney. The 250-pound fiberglass statue of the clown character sitting on a bench was taken April 27 from the McDonald's restaurant in Clinton. Authorities announced about 10 days later that it had been found, but they have not released further details. Restaurant owners Phil and Diane Koury have said the statue wasn't damaged. They were planning to move it to a secure location and have it refurbished and repainted as part of ongoing restaurant renovations.